This section is perfect if you are in a rush and just want to see the main benefits the Pro 1000 offers and whether its something that’s a good fit for your needs! The full review will take around 5 minutes to read but if you have the time, please go through it. 1. Is Anything Wrong With This Toothbrush Model? Put simply, NO there isn’t anything wrong with this particular model but what we will say is that it is one of the most basic versions Oral B make. It only comes with 1 cleaning mode and not a lot else. The higher end models are packed with much more features but some could argue whether they are really necessary. It costs $49.94 which is respectable considering what it has to offer and at the end of the day, it will clean your teeth to an excellent standard compared to manual toothbrushes. We are very fond of the Oral B Pro 5000 brush because it offers much more features such as: 5 cleaning modes, Bluetooth connectivity and extra toothbrush heads. It caters to people who have different issues with their teeth like sensitive gums, enamel issues etc. It costs double the price of the Oral B 1000 but that’s to be expected with all the extra features you get with it. We have written an extensive review of The Oral B 5000 if you want to take a look at it in more detail. 3. 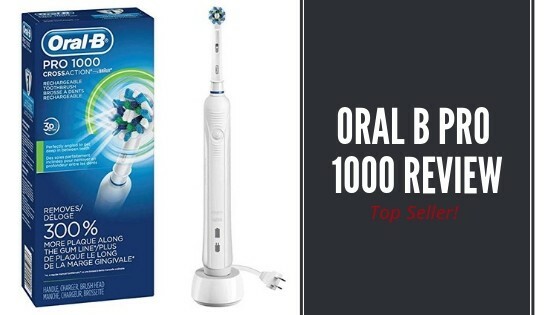 The Cheapest Place To Buy The Oral B Pro 1000? We have looked online and offline and the price is the same everywhere. On Amazon it is $49.94 and so too in Walmart. But we prefer Amazon because they consistently have fresh deals on everything. I mean currently they have a $10.00 Off Coupon if you decide to buy it now as it isn’t going to last. Plus you can see the reviews online to make sure there isn’t anything drastically wrong with it. The oral b pro 1000 is one of the more popular brushes with over 9000 reviews. Read what customers like about this toothbrush by heading over to Amazon. 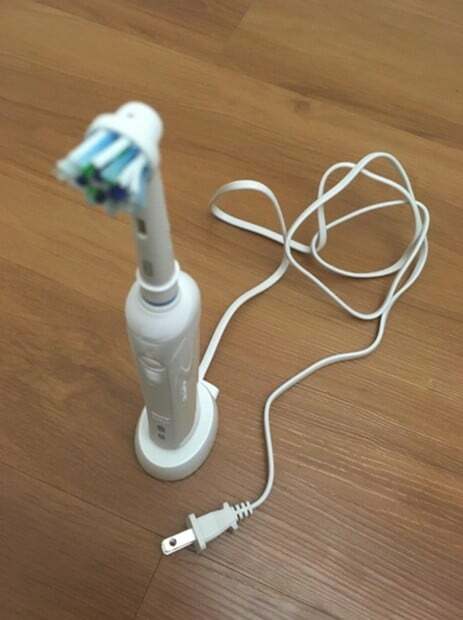 This toothbrush is more in tune with the American market simply because of the power sockets. Let’s say if your someone from Europe, you will need to purchase an adaptor in order for it to work. The oral B 1000 is a well-designed toothbrush which feels light and easy to use. It’s not too bulky and the brush head is compact. You actually get the CrossAction brush head which is one of the newer heads oral b came out with and gives you a thorough clean. It has hundreds of bristles that are angled at different directions to ensure they cross over different parts of the tooth surface more effectively than those bristles that are straight and not angled. We know some people won’t like this brush head and that’s fine, you can always replace it with another brush head of your choice because oral b allows compatibility among different heads, this is why its a popular brand! If you haven’t owned an electric toothbrush before you will certainly enjoy it because of the things it can do to make your life easier. The Oscillating Technology – toothbrushes have bristles which are usually arranged in a circle on a head which oscillates back and forth. Other technologies have been incorporated over the years, such as ‘3-D’ by Braun which combines oscillating, vibrating, and pulsating brush head movements to remove more plaque than a single head motion. Oscillating toothbrushes generally have a brushing action ranging from 2500 to 7500 rotations per minute as opposed to roughly 300 per minute when using a manual toothbrush. This is what allows the electric oscillating toothbrush to remove much more plaque. The Handle of the Toothbrush is made out of rubber which means you won’t lose any grip whilst you are brushing, even if your hands are wet. 2 Minute Timer – Dentists are always telling us to brush for exactly two minutes but for most of us this is an impossible task because when using manual toothbrushes we don’t have a timer close by so what ends up happening is either you brush for too little and end up missing a lot of the areas in your mouth or you brush for too long and this can cause toothbrush abrasion which harms enamel and can make gums recede. However with this toothbrush that problem is gone because the pro 1000 has a built in timer which will vibrate when the full 2 minutes are up. Even more cool is the fact it vibrates every 30 seconds to tell you to move onto another quadrant of your mouth. Pressure Sensor – This feature ties in with the problems you can face if you brush too harshly, and most of us do!. Toothbrush abrasion will occur overtime if you keep using too much pressure whilst brushing. But again this problem is reduced when using the Oral B 1000 because it has sensors which tells the brush to stop pulsating and reduce the speed if it detects you are brushing too hard. Battery Indicator – There are two light-up indicators shaped like a battery and an electrical plug. The battery one blinks green when you’re charging and the plug one lights up pink when battery power is getting low. You won’t know exactly when it’s going to fail, but you’ll at least have an idea that the end is near and it needs a charge. 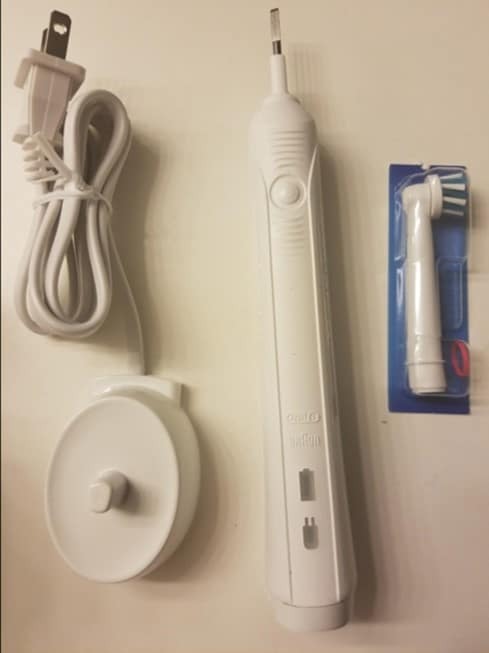 It’s an entry level toothbrush and if your someone who has never experienced the power of electric then this is definitely going to ease you into the new way of brushing. There’s not any fancy Bluetooth technology or wireless smart guide that you get with the higher end models and that’s a good thing because it will just cause you more confusion. It’s also suitable for kids to use, even toddlers but make sure to supervise them and in some cases you will have to do it for them as the vibrations might be too much for their tiny little hands to handle. It will also get them more involved in brushing. 1 Cleaning Mode – No nonsense, simple to use cleaning mode. Just switch the brush on and begin cleaning. Simple to get going and cleans well. Good Build Quality – The brush is nice and sleek and fits into your hand with relative ease. It’s not as bulky as other toothbrushes. It also has a rubber exterior so you can grip it more easily. 2 Year Warranty – If your Oral-B toothbrush is defective during the warranty period, you can get it repaired or replaced free of charge. Pressure Sensor – It’s a good feature but there is no light that tells us when you are brushing too hard. Not a huge deal breaker although this feature is available on other models. It’s Big – It’s 23 ½ cm tall, so it might not stand up inside smaller bathroom cabinets. Battery Life – many customers have mentioned that they had to change the batteries within a small amount of time. Although the battery lasts up to 7 days, they aren’t as good as the Phillips sonicare range. Limited Box Contents – You don’t get a travel case, storage compartment or extra toothbrush heads with this basic model. If you are a regular traveler, you might want to invest in something higher up. 1 Cleaning Mode – Just one cleaning mode means this is not great if you have sensitive teeth and gums or want to whiten your teeth. Once you take the toothbrush out of the box, get the cross action brush head and simply pop it on to the end of the toothbrush handle. Now before you use it for the first time, you will have to charge the unit. Get the charging station which looks like a white plastic lump with a smaller lump sticking up from it. It fits the hole in the bottom of the Oral-B Pro 1000. The cord is approximately 1 meter long which should be enough for most people. After 24 hours the indicator light should go off which signals the battery has been fully charged. Once charged you can start using it normally but make sure you follow the instructions. 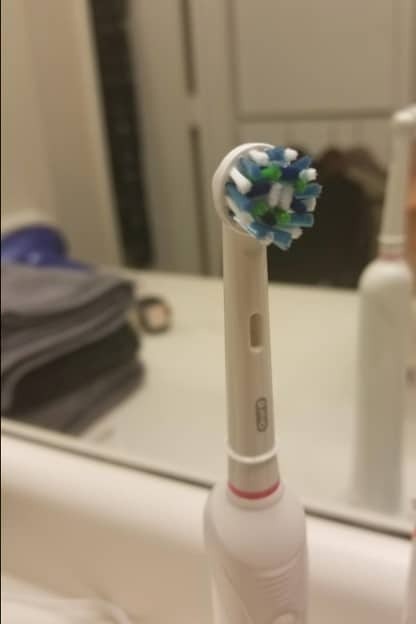 Remember its not a manual toothbrush where you just start scrubbing your teeth vertically, all you need to do is place the brush head on each tooth for 2 seconds or so and let the toothbrush do all the work. Is It Possible To Remove 300% More Plaque With The Oral B Pro 1000? If you go to Amazon or even the Oral B website you will see that it says this toothbrush removes 300% more plaque than manual toothbrushes. We know they are more effective but to such an extent? This made us do some research to see where this 300% came from and whether it is just a marketing gimmick. After reading through various journal papers we found that powered toothbrush demonstrated clinical and statistical improvement in overall plaque scores when compared to manual toothbrushes but a 300% improvement was not seen. But its still a powerful toothbrush and has been approved by the American Dental Association (ADA), in fact it was the first brand to be accepted by the ADA which means Oral B know what they are doing. We can attest to the quality of oral b because I have been using them for a long time. The one I use is Oral B 5000 which was an upgrade from the basic model I had 5 years ago. It is still functioning like new, nothing has broken and my teeth are looking in tip-top condition. The only problem you will encounter over the long term is battery issues. After 2-4 years it is most likely to fail due to the constant charge and discharge and the internal parts could wear out but anything beyond three years and you are doing well. What Do Customers Think Of The Oral B White Pro 1000? The Oral B White Pro 1000 toothbrush has over 9500 reviews to date with an average rating of 4.4 out of 5 stars, making it one of the highest sellers in history. We think this is largely due to the price which is very reasonable. The majority of customers liked how well the brush cleaned and made their teeth feel afterwards. The other great feature was the timer as most stated they had no clue how long they were brushing for when they were in the dark ages using manual toothbrushes. Quite a few mentioned they switched over from Sonicare to try out Oral B’s oscillating technology and immediately liked the rotating brush head which cleaned each individual tooth thoroughly. So, I decided to follow her advice. I saw the ratings on this and was very sceptical because of the bargain price. This is the best toothbrush I have ever used! It gets the job done, it notifies you via vibration when you’ve completed 2 minutes of brushing, and it’s very sensitive on the teeth. I’ve never had cleaner teeth every morning and night like this. We could go on and on about the good things people had to say but it will be better if you go read them yourself. It wasn’t all honky dory though as there were Some Negatives people mentioned. One of the main problems encountered was the battery. Quite a few mentioned how their toothbrush stopped working after a year which isn’t good but they should have remembered the 2-year warranty they get. It would have saved them a lot of money! But overall we have to say this is a great entry level toothbrush which gets the job done, no complicated jargon, Just turn on and away you go! well they are the number 1 online retailer and have high security and consumer protection. You get a 30-day money back guarantee and the added 2-year warranty from the manufacturer. You can also see the reviews people have left which makes it a lot easier for you to decide if its a good product or not and they even do comparisons between different models to show you the benefits of each. We would also say go and check out your local stores such as Walmart or even Target because we know they have periodic sales too, you might get a bargain!. But if you want to take advantage of the $10.00 Coupon, go over to Amazon Now. In this Oral B White Pro 1000 Power Rechargeable Toothbrush Review we have covered all the important points that you need to make an informed decision on whether to purchase it or not. It has a solid daily cleaning mode which gives you a thorough clean leaving your teeth refreshed after each session. It comes in 2 colour options : black or white and has a nice sleek design which fits in your hand comfortably. The battery life is okay but overtime it will deteriorate even further due to constant charge and discharge but that is to be expected of all electronic products. The downside is there are no extra features to get excited about like Bluetooth or the wireless smart guide but that doesn’t matter too much because an entry level brush should just focus on giving you a brilliant clean which the pro 1000 does. Q. What is the daily clean mode? A. This is the comprehensive everyday cleaning mode that works with the provided CrossAction brush head to effectively clean the teeth using the Oral-B 3D oscillating, rotating and pulsating technology to clean the teeth and remove up to 100% more plaque than a manual brush. Q. Does the pro 1000 toothbrush come with a warranty? A. If purchased new from an approved retailer the Pro 1000 will come with a 2-year warranty. Being a US or other region brush this warranty may not be supported in Europe. Q. Is this brush waterproof? A. The brush is water resistant but avoid prolonged immersion and do not leave it sat in water otherwise you will ruin it and void the warranty. A. The battery lasts up to 28 minutes, which if used on the standard daily clean mode is 7 days based on 2 cleans per day. 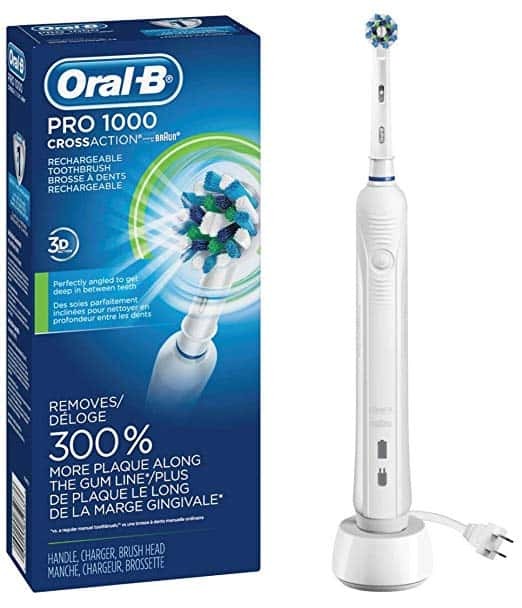 Have you previously or currently own the Oral B Pro white 1000? If so please leave a comment below and tell us your experience using it as it might help others to make a more informed purchasing decision. I normally don’t use electric toothbrushes, but this seems like a good basic one to start out with. When I have used one, I’ve always brushed simultaneously, so it’s good to know that you don’t have to do that with this electric brush. It seems like it’s pretty sleek and easy to grab too. I definitely don’t like using toothbrushes that are too bulky. I don’t think all the extra fancy features are necessary for a toothbrush, so I think this would be a good one to use for everyone. It’s totally your choice whether you want to stick with your manual toothbrush. If it’s giving you good results and your teeth and gums are healthy then there’s no need to invest in an electric toothbrush. What we would say though, is electric brushes have been clinically proven to be more effective at removing plaque than normal brushes.